Wexford Local Community Development Committee and Wexford Local Development recently approved LEADER Food Initiative grant aid totaling €266,713 for two well known Wexford food producers, Kelly’s Bakery in Wexford town and Wexford Home Preserves in New Ross. The LEADER Food Initiative is managed jointly by the Department of Rural and Community Development and the Department of Agriculture, Food and the Marine. Kelly’s Bakery employs a skilled workforce of thirty five people at their purpose built food production facility in Ardcavan Business Park, Wexford. The company ceased bread production in June 2018 to allow them to focus exclusively on specialist donuts and confectionary. In order to increase market share within a competitive business environment, the company has adapted to significant market changes in that they now focus largely on sub-contract manufacturing for a number of key clients supplying both the Irish and European sales units of these clients. In order to meet growing demand, the company must increase production capacity and efficiencies. After considerable research, they identified a specialist bread roll modular plant which will supplement and enhance current production technologies and vastly improve the quality and consistency of the finished donut and confectionery products. The investment in this high tech plant will give them a competitive edge by reducing the donut cost per unit by 30% and reducing wastage by 40%. In production terms their current capacity is 2,700 donuts per hour, while the new plant will have a capacity of 9,000 donuts per hour. The new plant will enable the company to offer a huge range of different products in a variety of shapes and sizes that its trade customers are seeking in order to expand their Irish and European markets. LEADER grant aid of €187,345 will sustain existing employment and also result in an additional fifteen full time jobs at their Wexford town base over a three year period. This will also result in a positive economic multiplier effect for the local Wexford economy. Wexford Home Preserves located in New Ross, Co. Wexford and owned by husband and wife Tom and Laura Sinnott is operating since 2009 as an artisan producer of jams/marmalades and savoury preserves using the old fashioned open pot boiling method in their production process. They have successfully developed a multi- award winning product range, using locally sourced fruit and vegetables as much as possible. They supply Dunnes Stores, Supervalu and Tesco as well as Centra, Londis and specialty stores to include Fallon & Byrne and Wrights of Howth located in Dublin airport. With the benefit of LEADER grant aid of €79,368, they are now embarking on a much needed expansion of their premises thereby enabling the company to increase production in line with demand. The existing kitchen space will be extended to incorporate an independent fruit preparation space and additional store rooms, facilitating improved production efficiencies. In a new development, a viewing area will be installed to enable buyers view the kitchen and its processes without any interruption to production. The viewing area will also allow the business to host visiting tours to the premises as part of the Taste Wexford food tourism trails currently being developed across the county, supported by Failte Ireland. This LEADER grant will take the business to the next level, sustaining the ten existing jobs and resulting in an additional three jobs in New Ross in the near future, thereby benefitting the local and wider economy in the New Ross area. 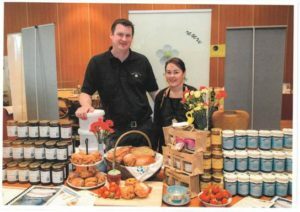 The WLD LEADER Food Initiative will continue to support other micro and small food and beverage producers in County Wexford over the next eighteen months. The funding covers the renovation and extension of production facilities, the purchasing of processing equipment, as well as supporting businesses in areas such as market development, competitiveness, and innovation. Potential businesses are strongly encouraged to avail of this unique funding opportunity and as for all LEADER funding applications, the first step is to contact WLD enterprise staff, Tom Bermingham or Helena Dempsey @ 053 9155800.